Just a few months ago, Intimidation Clothing releases the new Kyle “Kyote” Rozewski signature t-shirt. Since then, much has changed in Kyle’s life, but not his sponsor. Eight months after the unveiling of the signature Kyote design by Intimidation, the two have partnered again to add Youth Shirts, hoodies and additional t-shirt size (3XL). A veteran of 9 amateur and 14 professional MMA fights, Rozewski is a native of Western New York who now lives and trains in China alongside fiance Rebecca “The Professor” Heintzman. Since signing on with Intimidation in July 2013, Rozewski (@KyoteRozewski on Twitter & InstaGram) quickly became one of the brand’s superstars helping the company expand into Central and Western New York by sponsoring multiple Local MMA and grappling events. In addition, Rozewski has been a key piece to helping Intimidation establish sponsorships with amateur flyweight David Whitman and rising WMMA star Heintzman (3-1 pro). Rozewski, who returned to the cage for the Kunlun Fight MMA promotion on their April 4th card in Kazakhstan, now sits with a 8-5-1 professional MMA record which includes an 4-1-1 record while competing since moving to China. Rozewski is a native of Western New York who trained at Evolve MMA in Medina, Ohio before moving to China. A a veteran of the two Driven MMA events in Northeast Ohio, Kyote submitted Dustin Kempf in the first round of their featured bout at the Intimidation-sponsored Driven MMA One event in March 2014. He last fought in Cleveland in a featured bout at “Driven MMA presents NAAFS: Fight Nite in the Flats 10” in June 2014. A winner of 8 of his last 12 MMA outings, Rozewski scored all four of his professional victories in the USA via submission. During his 9-fight amateur career he was involved in 4 title fights and he holds an unblemished kickboxing record at 155 pounds. In addition, Rozewski is a Hayastan Level 3 grappler under Norman Yonkers and first degree black belt in Kenpo under Robert Koch. Rozewski also excels outside of the cage, where he works as a writer, and has also served as a commentator for the Intimidation sponsored TNT Fight Series in New York, Coveted FC in Ohio and Pinnacle Fighting Championships in Pittsburgh. He was also the co-host of The Kyote Ugly Show, a weekly Internet radio show/podcast where he works with veteran MMA journalist David McKinney. Intimidation Clothing was pleased to once again sponsor Norm Yonkers’ New York State Grappling Championships, as the Hayastan Grappling Challenge took place in the Empire State. Founded in 2004, the NYS Grappling Championships is the New York representative for Gokor Chivichyan and Gene LeBell’s Hayastan Grappling Challenge. Known for its organization and fair competition, the NYS Grappling Championships is one of the most prestigious grappling tournaments in the country. With rules that allow for competition that translates closer to MMA competition including leg lock submissions and a fair scoring system, the NYS Grappling Championships is a great opportunity for competitors and spectators alike. Intimidation Clothing is pleased to once again announce its sponsorship of the New York State Grappling Championships with their next event set to go down on May 17 in Fredonia, New York. Intimidation sponsored the last NYS Grappling event in April in New York, along with a successful seminar by Team Intimidation’s Kyle “Kyote” Rozewski in the Buffalo area. Competing at the event will be Intimidation sponsored Jeff Butkovich of Evolve MMA in Medina, Ohio. The event features a submission-only format, and more information can be found at www.nys-hgc.com. Intimidation Clothing is pleased to announce its sponsorship of the New York State Grappling Championships with their next event set to go down this weekend in Fredonia, New York. The Grappling Championships will be part of a busy weekend for Team Intimidation in New York, as the brand will also be on hand at the Kyle Rozewski seminar in Alden, New York on Friday night. Rozewski, a Buffalo native, is expected to serve as a both a referee and competitor in separate divisions in the NYS Grappling Championships. Intimidation Clothing is pleased to announce its sponsorship of an upcoming seminar in the Buffalo area on Friday night, featuring Team Intimidation sponsored fighter Kyle “Kyote” Rozewski and more. The seminar takes place at Robert Koch’s International Black Belt Academy in Alden, New York from 6-8:30pm on Friday night, April 11th. It will be followed by the Intimidation brand’s sponsorship of Norman Yonkers’ NYS Grappling Championship in Fredonia, New York on Saturday. Robert Koch’s International Black Belt Academy is “a world-leading organization promoting character developments, physical fitness, and self defense through the study of International Kenpo under the guidelines of the United Martial Arts Alliance.” The seminar features three pro fighters – Rozewski, Jeff Butkovich and undefeated WMMA rising star Rebecca Heintzman – instructing, and the Intimidation Clothing crew will be on hand to continue the support of combat sports in and around Buffalo. In the past year Intimidation Clothing has become a regular sponsor Buffalo native Rozewski and the TNT Fight Series as well as several fighters including amateur standout David Whitman who is expected to attend the seminar. The first weekend of April was busy for Intimidation Clothing, as fighters and events were sponsored all over the country to start a month filled with action. Multiple fighters were in action at the Midwest Fight Series event in Indianapolis, as Dustin Parrish and Bryant Whitaker both picked up wins on the card. For Parrish (1-0), it was a successful first foray into the pro ranks after a 9-1 amateur career that saw him as one of the most heralded amateurs in the Hoosier State. Parrish (pictured, right) took a split decision victory over Frank Sloan while Bryant Whitaker (4-2) took a second round submission victory over fellow Team Intimidation fighter Kyle Nickle (2-2) at the same MFS events. With the win Whitaker (pictured, left) has won 3 in a row after a 1-2 start to his professional MMA career. Also on the card, Intimidation sponsored fighter Cameron VanCamp (0-0-1) fought to a majority draw against Cody Groves (0-1-1) in his professional debut. In amateur action Chris Tanner improved his record with a first round submission victory and David Dever dropped a TKO loss to David Stephens. The Intimidation Indiana/Kentucky crew had a busy weekend, first putting together a banner night at Hardrock MMA 64 in Louisville, Kentucky on Friday, and then appearing at the POP!CON comic con event in Evansville, Indiana on Saturday. Team Intimidation fighters were in no short supply at the POP!CON event, as Ruben Perez, Ryan Conaway, Markus Hall and Patrick Ruby all made appearances at the Intimidation booth to greet and interact with fans and sign autographs. The Intimidation Michigan crew also had a successful night at the Exiled MMA: Insurgent event in Cedar Springs, Michigan. The Hardrock MMA 64 event was bittersweet for Team Intimidation, because despite a successful night at the Intimidation booth, the planned professional debut of longtime Team Intimidation fighter Brandon Hurst was scratched at the last minute due to his opponent pulling out of the fight with an injury. In Washington, sponsored fighter and Bellator MMA veteran Scott Thometz (6-3) dropped a hard fought battle, as he succumbed to a TKO against Jacob Boysen (6-1). This weekend, Intimidation will invade Western New York once again on the back of cornerstone Team Intimidation fighter Kyle “Kyote” Rozewski. First up, Rozewski will be on hand to provide a seminar at Robert Koch’s International Black Belt Academy in Alden, New York with Team Intimidation in attendance followed by Intimidation’s sponsorship of the New York State Grappling Championship in Fredonia, NY. 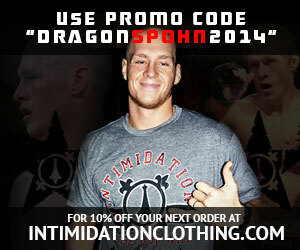 Intimidation Clothing is a fast-growing brand of MMA inspired clothing & gear with a growing national presence and over 50 authorized dealers across the USA. Known as the biggest supporter of local MMA, the Intimidation brand is also regularly featured on multiple sporting events on SpikeTV, AXS TV, SportsTime Ohio, MTV2, FUEL TV, The Comcast Network, Comcast SportsNet and EpixHD as well as MMA highlight shows on Spike TV, AXS TV and more. In addition to over 110 styles of high-quality, bold t-shirts and sweatshirts for men, women and children and is also known for their premium-quality EliteFighter MMA board shorts. Anyone interested in becoming a dealer can apply to sell the Intimidation brand as a dealer and they can be found for sale online at IntimidationClothing.com. Fans can also follow the marketing wing of the Intimidation brand, Intimidation Interactive Media, @IntimidationIM, like Intimidation Clothing on Facebook or follow @IntimidationMMA on Twitter.